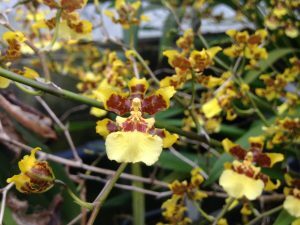 This large growing Oncidium species is native to Central America where it is found as an epiphyte in dryish forest from about 500 to 1500m altitude. 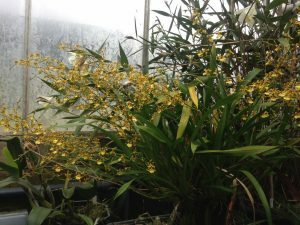 Our plant has been in the collection for about fifteen years and has now reached specimen proportions with more than twenty flower spikes and about 400 relatively large flowers. We grow this species in Warm Americas (Min 15C) in a 3ocm pot where it gets well watered in summer but a dryer winter after the bulbs have matured in late November. However we never let the bulbs shrivel.